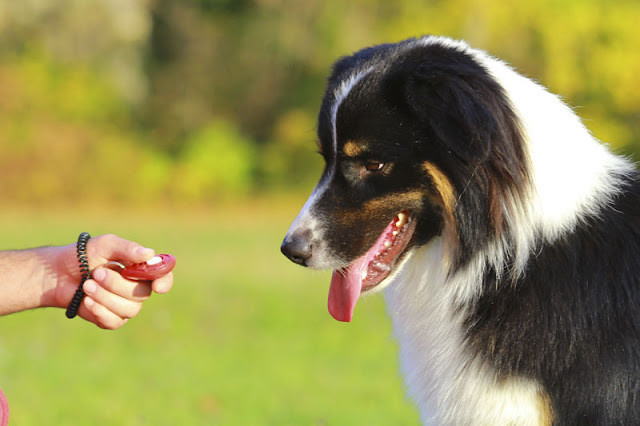 Scientists find unanticipated results in a study that compares the clicker to a verbal reward-marker and the use of food alone in dog training. The study, by Cinzia Chiandetti (University of Trieste) et al took 51 pet dogs and trained them on a novel task. 17 dogs were trained using a clicker, 17 using a verbal reward marker (“Bravo”), and 17 with only a reward. Then they tested the dogs to see how well they performed when asked to generalize the training to something similar and something more different. The results were a surprise to the scientists, who expected to find that using the clicker would lead to better results. In fact there was no difference between the three groups of dogs. A clicker is a secondary reinforcer, meaning something that predicts a primary reinforcer (food) is coming. This is a classical conditioning relationship (click means treat). The clicker or verbal reward is used to mark the precise time at which the dog is performing the behaviour that earns a reward. It is commonly used in reward-based dog training. Proponents of clicker training have often argued there is something about the click which makes dogs learn better. The purpose of the study was to test this idea, since we don’t know without empirical evidence (see: canine science is better than common sense). In this study, the verbal reward marker was “Bravo.” It was always said in a neutral tone of voice. The dogs were trained at their own home, either inside or in the garden. The dogs had only been previously trained by their owners, so they were not well-schooled in obedience training and had never been taught the task used in this study. There were two trainers who both used the same approach and who each trained half the dogs in each group. All sessions were video-recorded. The reward for the dogs was pieces of sausage or cheese, whichever the dog preferred. Regardless of the experimental condition the food reward was always delivered in the same location. There were two initial warm-up sessions to get the dog used to the trainer: teaching the dog to touch a box with their nose, and to put their paw on a box. During these sessions, the dogs in the clicker and verbal reward-marker conditions learned the association between the click or “bravo” and the delivery of food. The training session used a method called shaping, in which the dog is rewarded for closer and closer approximations of what they have to do. They were taught to open a plastic bread box by pushing the handle up with their nose or muzzle. The dogs had up to three training sessions a day until they were able to open the bread box 8 out of 10 times. A week later, dogs were asked to repeat the bread box-opening at least 3 out of 5 times. A few hours later, they took part in the experimental trials. The simple test used a different-coloured bread box that had had the back removed. In other words, it was very similar to the box used during training. The other test was more complex because it was a different size and shape, and made out of wood instead of plastic. During the experimental trials, no rewards were given, and the dogs only had 5 minutes in which to perform the behaviour. Half the dogs did the simple test first while the other half did the complex test first. They had to push the handle with their nose or muzzle to open the door of the bread box. Almost all of the dogs completed both the simple and the complex test. The scientists looked at the length of time taken in training and how many attempts each dog had at three different stages: to reach the first behaviour in training, to get from there to the criterion in training, and to complete the simple and complex tests. There were no significant differences between the groups. Just to be sure, the scientists also computed some indices of the number of attempts by time. Again, there were no differences. Given that rewards were always delivered in a fixed location, the scientists acknowledge it is possible the trainer’s movement towards that location may have acted as a visual secondary reinforcer. However, even if this is the case, it does not change the finding that there was no significant difference to the other conditions. 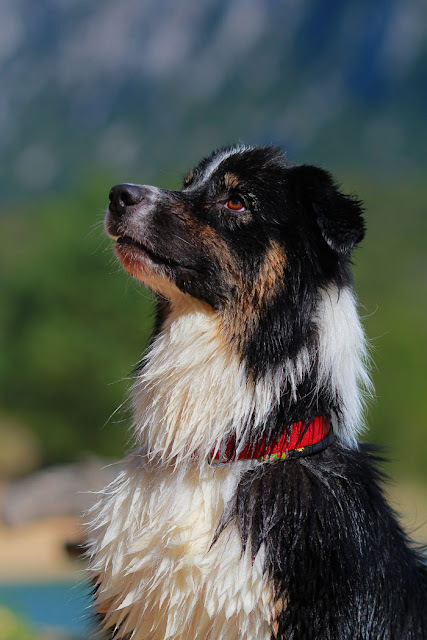 For people who train dogs, the results suggest you can use a clicker – or not – as you prefer. Some people enjoy clicker training a lot and find it fun; they will want to continue to use it. Some people find it fiddly and will prefer not to use one. What’s nice about this study is that it involved training pet dogs at home, so it’s likely to generalize to other dog training situations. We also know the dogs were motivated, because the reward was either sausage or cheese, depending on their preference. For people who are new to dog training, one thing to note is that all three methods worked because food is an effective way to train a dog. It may be that reward markers such as the clicker are best suited to training in which precise timing is important, and that other kinds of task than that used here might show a difference. Further research can investigate this. The researchers say it would be interesting for future studies to try a more enthusiastic delivery of the verbal reward marker to see if that makes a difference. You might also be interested to read the results of a subsequent study from a different research team that investigate the use of a clicker-plus-food versus food-only in a novice trick training course, and found few differences between them. Do you like to use a clicker in dog training? Companion Animal Psychology is a participant in the Amazon Services LLC Associates Program, an affiliate advertising program designed to provide a means for sites to earn advertising fees by advertising and linking to Amazon.com and Amazon.ca. I use a clicker/marker only for 'transient' and distant behaviours. IF you can reward while the behaviour is happening or almost immediately afterwards, there is no need of a marker. The 'behaviour" I always use to illustrate the 'power' of 'the clicker" is teaching a dog to jump over a hurdle. You cannot reward while the dog is in the air over the hurdle but must wait for the dogs to land and come to you (unless you chuck the reward as the dog is in the air). Similarly with teaching a dog to go out to a distant target. This is a very specific task, and one in which the food delivery can be delivered very quickly after the behaviour. Since the 'trainer' was present we also do not know just what behaviour on the trainer's part could have been used by the dogs to predict a reward. I know that with one of my dogs that just thinking to whistle to 'mark' the behaviour was enough for him to know the reward was happening. When I then changed to a clicker I had to hold the clicker behind my back or he would anticipate just seeing just a tiny movement of my thumb (pre-click). Dogs are so attuned to our body language, facial expression and breathing patterns that they can seem truly telepathic.